Apple Pecan "Porc au Coq"
Technically, this coq au porc recipe should have been included in my recipe book — Paleo Home Cooking — but unfortunately, when all was said and done, we ended up with a few pages too many; six, to be exact… Sadly, some content had to be sacrificed: which meant I was gonna have to pull a few recipes. Now don’t go thinking that I picked this one because I thought it was sub-par… far from there. I ended up choosing this one because it’s a tad on the lengthy side, so it would’ve required more than 2 pages, but wasn’t so extensive as to require 4. Printing a recipe across 3 pages isn’t really all that practical. So since it was giving us a bit of a headache, from a technical standpoint, it became a logical pick. Besides, it’s not like it would be completely lost and disappear into oblivion for all eternity. I figured I could very well share it with you on the blog, instead. Granted, I won’t be able to show you as many step-by-step pictures as I usually do, but I still have a few decent shots so you’ll get the idea! 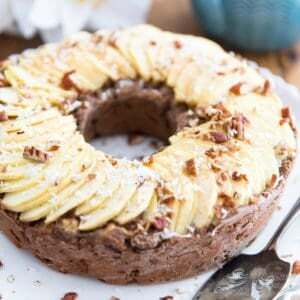 After all, I find it makes much more sense this way: I used pork loin, instead of tenderloin, which left me with considerably more room to play with, thus permitting the addition of all sorts of tasty ingredients, like the apples, pecans and fresh herbs that I chose to add here. Once you’ve given this a try, I think you too will be convinced that this is the way to go! When I make roasts like these, I like to brine my meat for a bit. While this step is not absolutely mandatory, it creates a much juicier and tastier meat and requires very little effort on your part. Trust me, it’s not worth skipping. 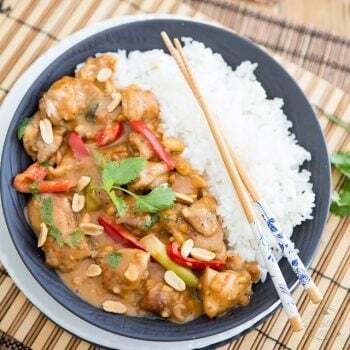 All you need to do is, the previous night, dissolve some salt in some water (one teaspoon of salt per cup of water) and then place the pork loin and chicken breast in the solution, making sure that the meat is entirely covered with the brine. Place that in the fridge and forget about it until the next day. When you are ready to make your roast, preheat your oven to 350°F (177°C), take the meat out of the brine and pat it real dry. 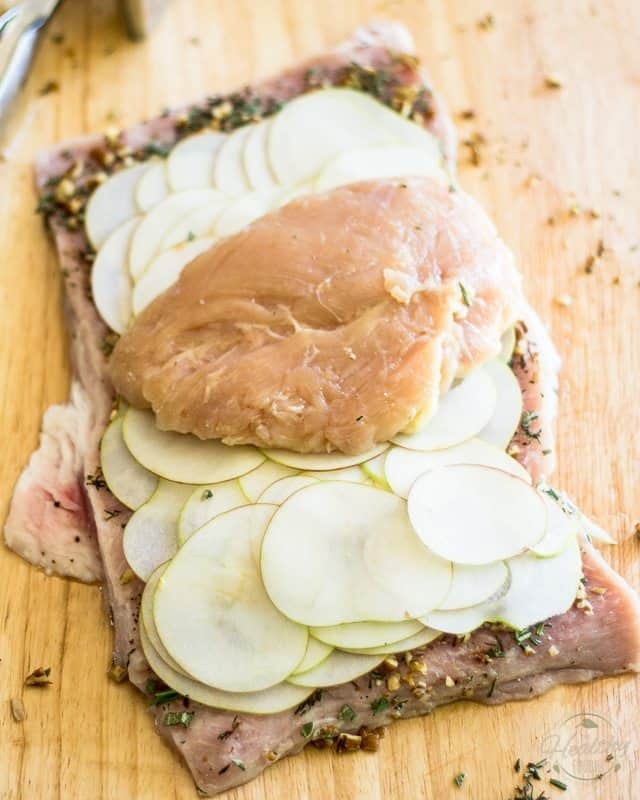 Now, you need to turn your pork loin into a flat rectangle. To do that, lay it on your cutting board with the short end facing you. Hold your knife parallel to the work surface and begin cutting along the long side, about ½ inch above the underside of the roast. Continue slicing inward, pulling the meat back with your free hand, unrolling the loin as you go. Next, cover the butterflied pork loin with plastic wrap and, with the help of a meat mallet or small saucepan, pound the loin all over to flatten it into an evenly ½-inch thick rectangle. 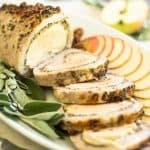 Spread 2 tablespoons of the ghee over the entire surface of your pork loin; sprinkle with the salt, pepper, fresh herbs and chopped pecans, then top with apple slices. To slice the apples, I strongly recommend that you use a mandoline, so you get them really really thin as they need to be highly pliable. If you didn’t have a mandoline, you could also use a sharp chef’s knife, but make sure you slice that apple as thinly as you possibly can. 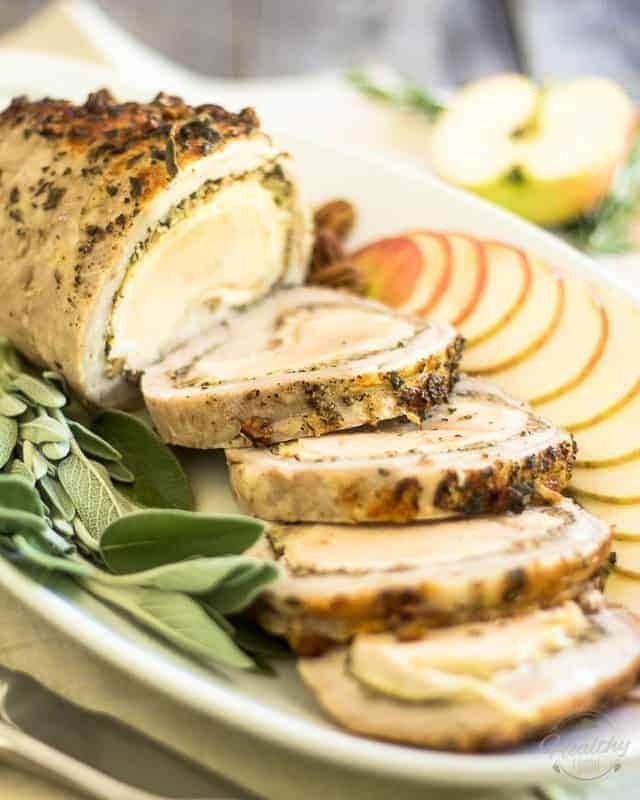 Place the chicken breast right over the apples, smack in the center of the pork loin (as pictured above) and fold both ends of the roast up and over it as tight as you can. Now flip the roast over and tie it securely with butcher’s twine in approximately 1½-inch intervals, then run another piece of twine across the entire length of the roast, to make sure it’s really tight and secure. 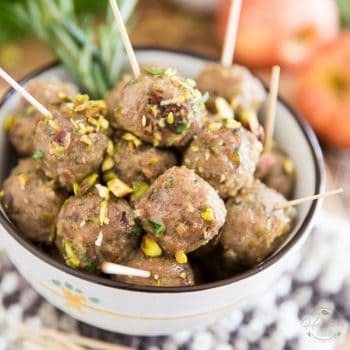 Transfer the roast to a baking dish, dab the remaining tablespoon of ghee over the top and sprinkle with the herbs and nuts that fell out at the time of rolling. Cover with aluminum foil and bake in the oven for 45 minutes; Remove the foil and continue cooking for another 30 minutes, basting from time to time with a basting brush. I bet you’ll be wanting to do that! But you’re gonna have to wait a little longer. Sadly, you won’t even be able to look at your beautiful roast while you wait, because you’ll be covering it with aluminum foil while it rests. So go ahead and remove your roast from the oven, and then tent it loosely with a piece of aluminium foil. Let it rest for 15 minutes, then slice and serve . This Porc au Coq kinda serves a crowd, so there’s a very good chance that you’ll be generating leftovers, lucky you! 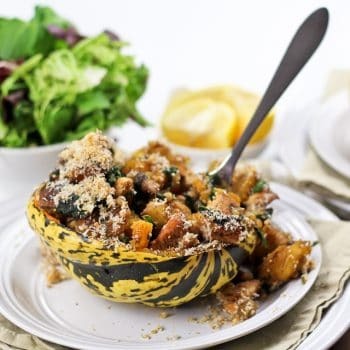 These leftovers will keep for up to 3 to 4 days in the refrigerator and can be reheated super easily: simply slice her up and throw them slices in a skillet over medium heat. Trust me, it’ll be just as good, if not better! 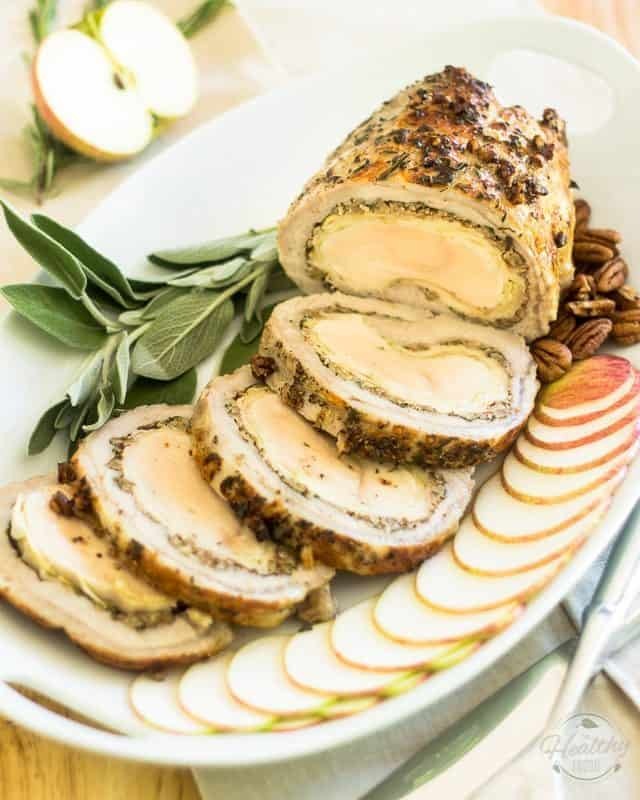 A delicious pork loin stuffed with a whole chicken breast, sliced apples, pecans and fresh herbs, this Apple Pecan "Porc au Coq" is sure to please! The previous night, make the brine, if using*: Dissolve the salt in the water and place the pork loin and chicken breast in the solution. Preheat the oven to 350°F (177°C). Remove the meat from the brine and pat it real dry. Slice the pork loin into a flat rectangle. To do that, lay it on your cutting board with the short end facing you. Hold your knife parallel to the work surface and begin cutting along the long side, about ½ inch (1.25 cm) above the underside of the roast. Continue slicing inward, pulling the meat back with your free hand, unrolling the loin as you go. 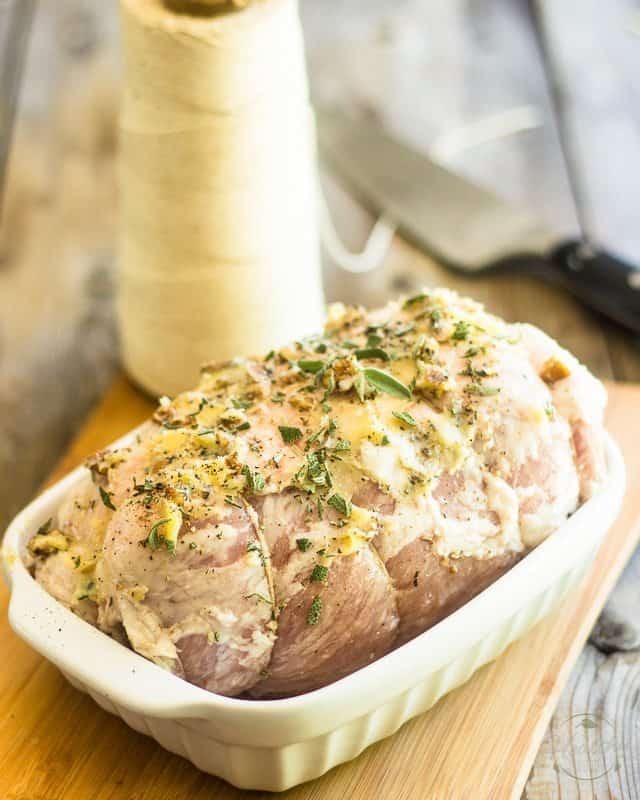 Now cover the butterflied pork loin with plastic wrap and, with the help of a meat mallet or small saucepan, pound the loin all over to flatten it into an evenly ½-inch (1.25-cm)-thick rectangle. Spread 2 tablespoons of the ghee over the entire surface of the pork loin. 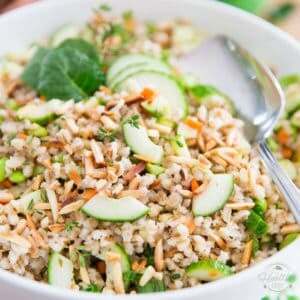 Sprinkle with the salt, pepper, fresh herbs and chopped pecans, then top with apple slices. I strongly recommend that you use a mandoline to get those slices really really thin as they need to be highly pliable. If you didn’t have a mandoline, you could also use a sharp chef's knife, but make sure you slice that apple as thinly as you possibly can. 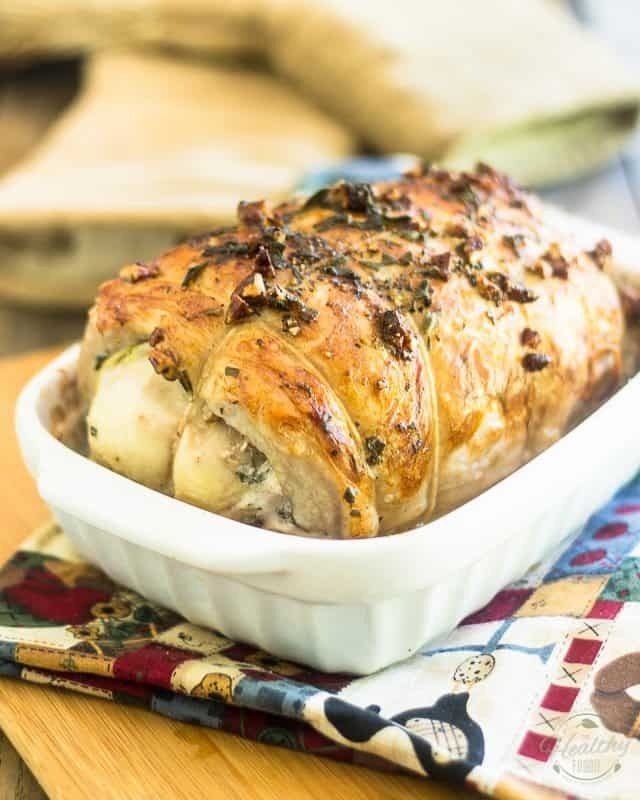 Place the chicken breast right in the center of the pork loin and fold both ends of the roast up and over it as tight as you can. Flip the roast over and tie it securely with butcher's twine in 1½-inch (4-cm) intervals, then run another piece of twine across the entire length of the roast. Remove the roast from the oven, tent loosely with aluminium foil, and let it rest for 15 minutes, then slice and serve . 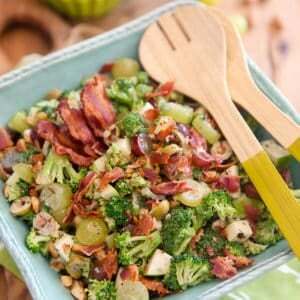 This dish will keep for up to 3 to 4 days in the refrigerator. To reheat, simply slice it up and panfry it in a skillet over medium heat. 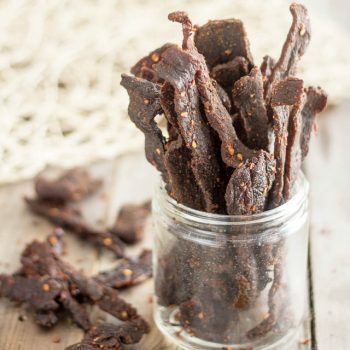 *While this step is not absolutely mandatory, it creates a much juicier and tastier meat and requires very little effort on your part. Trust me, it's not worth skipping. My husband LOVES anything roulade-style! 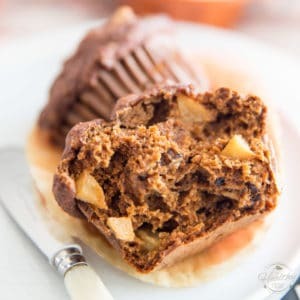 This recipe is so interesting and beautiful. Definitely going on the “to make soon” list. That looks amazing. Definitely something I’m going to try.